I have been waiting to show you this since the Spring and I can finally reveal it! I’d like to introduce you to my friend, Guss. Isn’t he fabulous? You may have noticed that we are in love with the Laura Heine style fabric collage animals here. Don’t miss seeing the wonderful zoo of other fabric collage animals my students have made by clicking here! Trust me, you are going to want to see the flamingo on this page too! Penguins are my spirit animal so I wanted to create my own using a line drawing. Now, I’d certainly recommend you use one of our animal patterns the first time you do this technique but you can also choose to make your own pattern like I did with my penguin, Gus. First, I found a line drawing of a penguin I liked and traced it onto some paper. Then I placed a swath of Pattern Ease onto that paper pattern and traced my penguin with a Sharpie. Pattern Ease is like Swedish Tracing Paper- it is an interfacing. Here’s a photo of him in progress taped to my wall. I fused Steam a Seam 2 onto the backs of my floral fabrics and then cut out oodles of flowers. Steam a Seam 2 is both sticky and repositionable which allowed me to play and find the best combinations of fabrics as I was building him in order to give him dimension. I also like using these scissors with a micro-serrated edge to help bite into the fabric as I make all the directional changes when cutting out the flowers. tI used a ton of scraps and cut out a mountain of flowers but there are also little fun “Easter Egg” items tucked into Guss waiting to be found. He likes ice cream so you’ll find some ice cream sundaes in his right wing. He preens a lot so there is a camera in his left wing. There are loads of parrots, birds and other winged friends hiding throughout his little body, too. Once you love him you’ll fuse everything down to the Pattern Ease. Don’t forget to use a pressing sheet to protect your iron! Next, you’ll carefully cut out your animal. So, you the Pattern Ease behind the animal will stay in your final quilt. Finally you’ll put a bead of Fabric Fuse all along his outside edges to glue him to your background. When I fused him down I placed him on a lovely grey fabric that is perfect for him. Then I decorated around him with more flowers, feathers and fun! I wanted to frame him out a bit so naturally he demanded a bow tie border. Because… PENGUINS!! 🙂 I used a Dresden Plate wedge template I had laying around to cut out 22 degree wedge shapes out of brights and used left over flowers fused down for the bow tie centers. So, what do you think? Have you wanted to try making a fabric collage animal yourself? I highly recommend getting Laura Heine’s book all about it as it has great instruction. Then, pick out one of her patterns and start playing! It is so much fun!! I took a bunch of the student fabric collage quilts with me to the Love of Quilting set to show Sara how this technique is accomplished. It was fun seeing them all on set! Guss was featured in the 3202 show for the Fons and Porter Love of Quilting show on PBS. They just released the promo video for the episode too! Take a look! 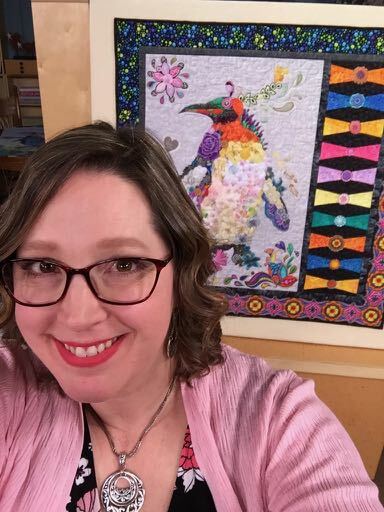 Oh, and if you’d like to see other quilts of mine I’ve showcased on the Love of Quilting Show… click here! This episode of Fon’s & Porter’s Love of Quilting begins airing around the country in the summer of 2018. You can check with your local PBS station to find out when it will air in your area. Click here to find your local PBS station! Previous post: APQS Beginning Longarm Class is August 3!